Our culinary tour through Asia continues with this dish. Easy enough for a weeknight meal, there was more than enough left for lunch the next day. Marinate steak for at least 15 minutes, longer is better. Add oil to hot wok. Stir fry garlic, ginger and scallions for 30 seconds. With a slotted spoon to reserve the marinade, remove half of the meat and stir fry for 3 minutes. Remove and set aside. Repeat with remaining steak. In the same wok, add oil and stir fry the onion and green peppers for 2 minutes. Push vegetables to sides of wok. Add marinade to center of wok and stir until thickened and bubbly. Blend in vegetables, add steak and heat thoroughly (about 5 minutes). 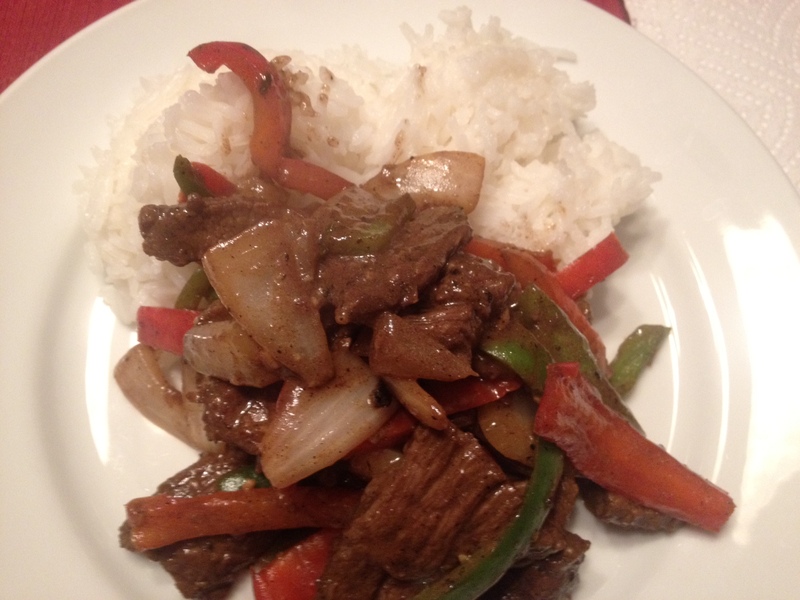 The right blend of savory and sweet, this dish is lovely with a side of jasmine rice. Modified from this recipe on Big Oven.